My first career was in aerospace engineering – designing rockets for NASA. I've now taken that engineering mindset and applied it to the art of making chocolate. After studying how commercial chocolate is typically made, I set a goal to create a tastier and healthier product. That's how Gourmet M was born. 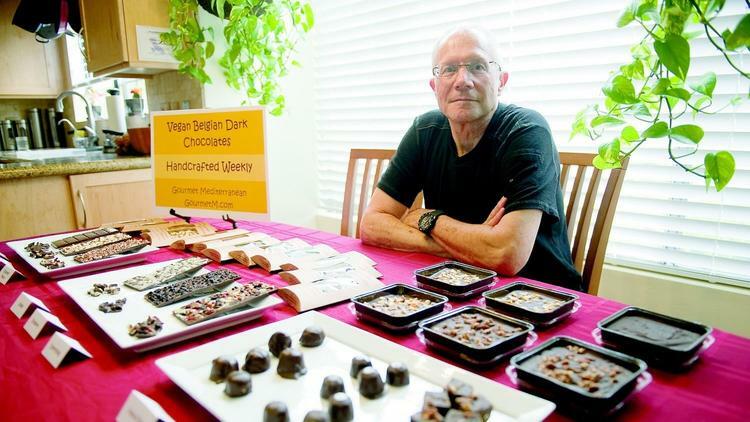 I now create a new kind of gourmet treat using Belgian dark chocolate – incredibly rich in flavor and free from dairy, palm oil and animal products – and incorporate dried fruits, fresh roasted nuts, exotic spices, and more. All of our chocolates are handcrafted goodness, made in small batches in our Carlsbad kitchen – vegan, gluten-friendly, and out-of-this world. – Michael Ross, Founder & "Chocolate Engineer"
Contact info@GourmetM.com for our farmers' market schedule and for inquiries and orders. Permit #: DEH2013-FCFO-000057, Issued by San Diego County, Department of Environmental Health, Food and Housing Division. All products are made in a home kitchen, under bill AB1616 California Homemade Food Act of September 21, 2012 ("Cottage Industry" law).